At Westlake Hills Dentistry in Austin we want you to have the most attractive and healthy smile possible. Partial dentures are one way Dr. Ho can help to restore your smile and confidence. While full dentures replace all of your teeth, partial dentures are used to replace only a few teeth. 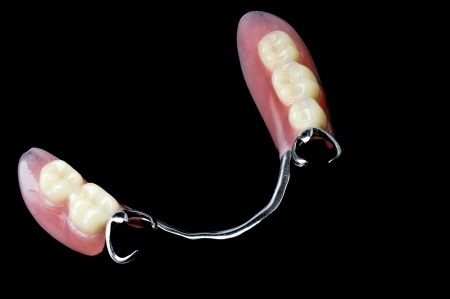 Partial dentures are attached to a metal framework which holds them in place. They can be removable and held in place by attachments to your existing teeth, or cemented in for a more permanent fit. Dr. Ho will discuss your particular needs with you and help you decide which type is best for you. First Dr. Ho will take impressions of your bite and teeth to be sent to the laboratory so your new partial dentures may be fabricated. At the laboratory the color of your teeth and gums are matched so that your new partial dentures look natural. He will also discuss your treatment options and help you decide what your best options are. Next he will prepare your teeth for your new partial denture. Attachments may be used to hold the partial denture in place. These are metal clips used to hold the partial denture while you wear it. If there are a lot of teeth missing, or the jaw is not stable the doctor may opt to use implants to hold your partial dentures in place. The doctor may also choose to place crowns on the adjacent teeth to hold the partial denture in place. If you need to have teeth extracted the doctor may fit you with a temporary partial denture. This denture will also be fitted and adjusted so that your teeth will not shift before you receive your permanent partial denture. Dr. Ho will discuss your options and answer any questions you may have before proceeding with the partial denture preparation and placement. When your partial dentures arrive in our office you will come in and have them fitted and adjusted. Dr. Ho will check your bite, your speech, and check the appearance of the dentures. Your new partial dentures may require a few adjustments before they fit perfectly. Once you and the doctor are happy with your new partials you will leave our office with a brand new and confident smile. Most people find there is a short adjustment period in order to get used to wearing partial dentures. This is perfectly normal, and it is normal that you may want to come in a few times to get your dentures adjusted. As you get used to wearing your dentures they will feel like your natural teeth and you will be able to go about your day-to-day activities and not even notice you’re wearing them. While your partial dentures are sturdy and with proper care will last for many years, they can break if you drop them. When you are cleaning and handling them put a towel down or stand over a basin of water to protect them if you do drop them. After you remove them from your mouth soak them in a denture cleaning solution or plain water so they do not dry out. Don’t use hot water since this may cause your dentures to warp. Brush your dentures each day to remove plaque and food deposits. This also helps them from becoming stained. Even if you use an ultrasonic cleaner, you still need to brush them each day with a soft bristle brush. If your partial dentures break, crack, chip, or become loose visit our office as soon as possible. Do not try to adjust your dentures yourself as this can damage them beyond repair. Partial dentures are an excellent way to replace missing teeth and restore your smile. For more information partial dentures in Austin, Texas, contact Westlake Hills Dentistry today. Our offices are equipped to provide an array of restorative procedures such as porcelain veneers, dental implants, composite bonding, and tooth-colored fillings.